Episode 8: Social Media Metrics With Jim Sterne | Beyond Web Analytics! In this episode we talk with Jim Sterne, co-founder and current Chairman of the Web Analytics Association, about Social Media Metrics, the Web Analytics Association, and the future of the Analytics industry. The discussion probes the benefits of membership in the WAA, and the other initiatives in the industry working to help individuals improve their skills with Analytics, as well as the ever changing channel that is Social Media. Jim Sterne is an international consultant to large corporations and entrepreneurs. He has focused his twenty five years in sales and marketing on measuring the value of the Internet as a medium for creating and strengthening customer relationships. Jim has written six books on Internet advertising, marketing and customer service including, “Web Metrics; Proven Methods for Measuring Web Site Success.” and the next to appear will be “Social Media Metrics: How to Measure and Optimize Your Marketing Investment” in May. 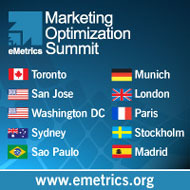 Jim Sterne is the producer of the international eMetrics Marketing Optimization Summits www.emetrics.org and is the co-founder and current Chairman of the Web Analytics Association www.WebAnalyticsAssociation.org Sterne was named one of the 50 most influential people in digital marketing by Revolution, the United Kingdom’s premier interactive marketing magazine at the time and more recently was named one of the top 25 Hot Speakers by the National Speakers Association. This article was posted in Podcasts, Social Media, Web Analytics and tagged Jim Sterne, Podcast, Social Media, WAA. Bookmark the permalink. Follow comments with the RSS feed for this post.Post a Comment or leave a trackback: Trackback URL. The sound file appears to be corrupted. It is nothing but stuttering static at least for the first few minutes and is completely unlistenable. I’m hoping to hear this so I hope you can get it fixed! I tested the download and playing the file via the web player and both worked for me. Please email podcast@beyondwebanalytics.com if you continue to have issues. Be sure to include OS / Browser / Player info. What a great podcast with some great advice especially on the stance of WAA and the rest of the world. It was great to hear Jim say “You have to make it what you want it to be” which I completely agree with. People who enjoy web analytics need to start doing things whilst they can and have the opportunity to help define and establish web analytics in their own regions. Great stuff, keep up the great work! !